The silent majority was there for Trump, not the other Republicans. Trump supporters were entirely bullied and shut down; it's markedly more dangerous to publicly call yourself a Trump supporter than it was to call yourself a Romney supporter back in 2012. It's also why, according to numerous media outlets such as CNN, Hillary was leading in virtually every single poll shown, with many expecting her to win in an unprecedented landslide. being publicly "bullied" and "shut down" (lol) has absolutely zero effect on how a poll works. polls don't announce to a large hate mob Joe Shmo is going to vote for Trump. the silent majority is just the same people it has always been. the polls as the race were tightening were in a pretty standard margin of error. 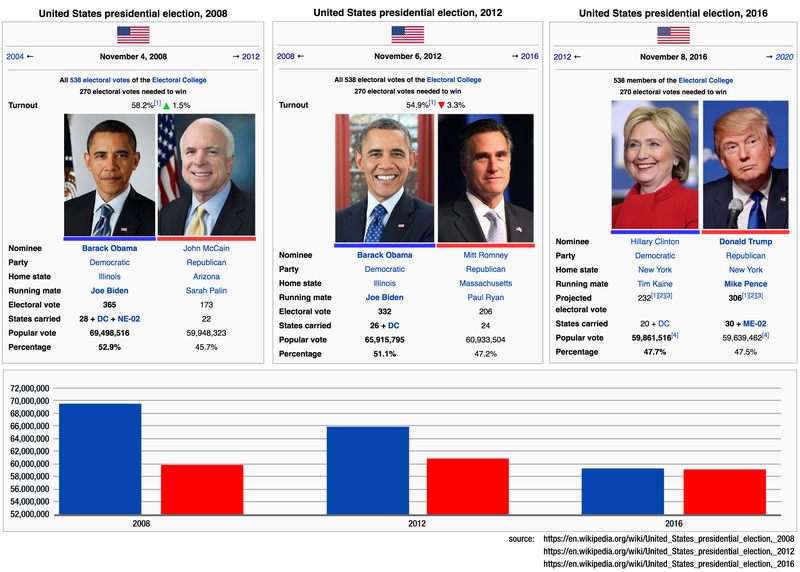 there was no massive influx of people who didn't vote for romney or mccain. the democrats failed to show up. big funding numbers are in no way correlated to the actual support of a candidate. especially one that had so much contribution from people other than regular old small donors. It certainly does have an effect on how polls work, if you've been paying attention. Because it was socially unacceptable to be a Trump supporter (again, unlike Romney or McCain supporters), many kept quiet and waited until election day; that's hindsight observation. You still haven't explained why Hillary was always in the lead, why she was expected to win by a landslide by nearly every single media outlet. Even Liberals on Quora who at first denied the silent majority admitted to it being the reason Trump won. Millions of people who voted for Trump also voted for Obama. But, you know, due to the failure of Obamacare, those lot got paranoid about another Democrat holding office and were desperate for a Republican. Not a historic turnout whatsoever. Obama had a historic turnout. You are correct in what you said and I am not trying to belittle that achievement. Trump has a historic win. He won with next to no support from his own party while relentlessly being attacked by his own, a media that had negative coverage balance upside down, and an opponent who should have been in prison. He had no political experience at all. Pundits kept telling his supporters he never stood a chance. Yet he won the most powerful office in the world where he will be in command of nearly half the world's military power. And it is because Ryan and others did not support him he comes to power with the extremely unusual position of negotiation that America has not seen in a very long time - he owes no one. This means he can do what he wants and make deals with anyone regardless which side of the aisle they are on. FOX news was even saying his rise is so unexpected and amazing that he may be matched only by George Washington. I am paraphrasing and don't recall their exact words, but they were saying that Trump may be the first to have such a politically powerful position from the start. The only thing historic about trumps victory is just that. Literally anyone not named Hillary running would have drawn the voters needed to win those key states. Either way, it is always an uphill battle for Republican Party, so he still deserves some credit and, a chance. I know I'm rooting for him! I voted for obama in 2008 if that says anything about the subject. I actually still like the guy. Trump is in a league of his own and will prove to be his own man. Trump will forge his own signature upon the presidency like none before him in our life time. He will be his own man both domestically and internationally. Trump will prove to be a man of his word and that will give our allies confidence and our enemies fear of America. We will see powerful world leaders showing deep respect and we will be proud once again to be Americans like never before. gporter, I don't believe anyone else would have been able to beat Hillary, because no one else was bold enough to go after her like The Donald did. Everyone else plays by the rules. For Trump, everything was on the table. Well he is certainly more exciting than John McCain and Mitt Romney....which brings me back to my point that the more exciting candidate always wins. I was wondering on election night why they froze the map with Michigan and Arizona not called. Today one of the news services called Arizona for Trump, who won it by 4 points. But a news organization calling a state doesn't make it official or legally binding. Those two states apparently are still in play and can flip when "uncounted" ballots are "discovered" - if anyone can cite they are officially called, let me know. Then about nine electoral votes need to be flipped (not certain of the math exactly). I have no idea if this is an issue or not, or how it would play out if it is an issue. But I never felt that the election was over on the night of the eighth, and so I had an uncomfortable feeling about posting about the race after it was called for Trump. Remember on the list above in my first post, we are at the claim, Trump will not be the president-elect, which simply means he will not win the electoral college. Like I said, this is where it gets good, folks. However, I do know that Trump will be sworn in as the 45th president. i've been paying plenty of attention. people who participate in polling are not being targeted. there is no way for them to target people who said the polls they would vote for trump. they were not part of some petrified voting base scared to say anything pro-trump because they're going to be assaulted. that's hilariously painting trump's supporters as victims in a way they are absolutely not. if anything, the lesson to be learned here is that Hillary's lead was never as big as it seemed to be because analysts failed to account for how well some states are polled. Wisconsin isn't a well polled state, neither is Michigan.evidence of this was already clear when Bernie somehow overcame a 15 point differential in Michigan, lol. another way of looking at this "massive turnout" is not supported by numbers. yes, trump was more supported by white older males without college degrees than Romney was, but the rest of it falls right in line to typical demographics of republican voters. i really suspect the attempt to alter this narrative is simply because it's more ~cute~ and is more fun to believe if you're on the right side of it. but the reality of it remains is that trump was within the margin of error of the polls, and he won in a historic manner not based on a historic turnout. the usual republican voters didn't disappear and suddenly get replaced by this "silent majority" that appeared out of thin air, lol. it's especially not because what is the most vocal, rowdy campaign base ever was too scared of "backlash". media outlets did predict it would be a "landslide" based on the polls being right, which would have been the case. but pundits and analysts that don't work for CNN or Fox were saying is that it would be closer than most realize. they were right. However, I do know that Trump will be sworn in a the 45th president. Huh? He's already won. On the Yahoo electoral map, there are 2 states not called, Michigan and New Hampshire. Trump is ahead in Michigan by 11,837 votes with 100% reporting and Clinton is ahead in New Hampshire by 2,528 with 100% reporting. After those 2 states are called, Trump wins the electoral 306 to 232. I'm a little confused. With the Democrats empowering us to vote for the first female President for nearly a year (it's actually been 4 years but I'll cut them some slack), why aren't they congratulating the beautiful Kellyanne Conway? She is the first female Presidential campaign manager to run a successful campaign! 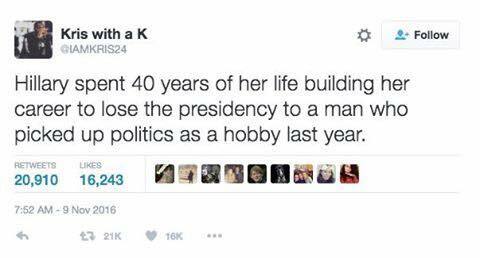 And she didn't ride the coattails of her husband to get her a jump start either. She did it herself. Now that is true feminism. She deserves proper recognition! Is Arizona official? I am hearing that it hasn't been made official by the state of Arizona. Look, I don't know if I am right or wrong with this information. I hope I am wrong, really. But if there is a play on the electoral college, just keep the faith, because it could get dicey in what we hear. But no matter what we hear, Trump will be the next president. Look, I don't know if I am right or wrong with this information. I hope I am wrong, really. But if there is a play on the electoral college, just keep the faith, because it could get dicey. Trump will be the next president. Don't worry, man. It's 100% over and Trump is our next president. Trump train has no brakes. No candidate won the majority, so who wins the election? You got a lot wrong, buddy. I'm also unsure if you even know what I mean by silent majority, as you just keep taking the numbers at face-value and not much else, but I'll keep explaining in spite of that. i've been paying plenty of attention. people who participate in polling are not being targeted. there is no way for them to target people who said the polls they would vote for trump. Strawmen. I never said that. People were targeting Trump supporters in general, regardless if they were polling or not, which wasn't as often. And really, how could you even be in denial of that? It became a well-known stereotype that Trump supporters were racist, uneducated rednecks. That was everywhere. Hillary was leading the polls since Trump supporters didn't want to come out; if they did, they'd be harassed. Not everywhere, but in a lot of places. they were not part of some petrified voting base scared to say anything pro-trump because they're going to be assaulted. that's hilariously painting trump's supporters as victims in a way they are absolutely not. Sure, accuse me of cherry-picking, that'd be easy. But the fact of the matter is that Trump supporters were put in a much more negative light than any others. You really haven't said anything substantial to disprove this, only "they're not victims", which isn't an argument. By the way, I don't like Trump, I'm not defending his supporters out of some ideological obligation, I'm just pointing out the facts you seem to be refusing to accept. if anything, the lesson to be learned here is that Hillary's lead was never as big as it seemed to be because analysts failed to account for how well some states are polled. Wisconsin isn't a well polled state, neither is Michigan.evidence of this was already clear when Bernie somehow overcame a 15 point differential in Michigan, lol. And that picture doesn't prove much. The number of Republican voters happen to be more consistent than Democrats. That's not concrete affirmation on your part. i really suspect the attempt to alter this narrative is simply because it's more ~cute~ and is more fun to believe if you're on the right side of it. I really suspect you don't understand what we're discussing. If by " cute" you mean common sense-y, then yes, I agree. I'm gonna have to simplify this and put it in point form. -Why? Because of silent Trump supporters. Romney got 27% of the Hispanic votes, and Trump only did have as well before the elections. Electoral demographics can change. There's not much else to say. It's common knowledge that there was a silent majority backing up Trump at this point, after he won. If you're really going to take my use of statistics and logic to prove such an obvious fact as just "changing the narrative 'cause it's cute", then you're not worth debating. It's like a Holocaust denier telling you you're just fabricating a narrative to put yourself in the right. Illegals are protesting Trump with Mexican flags yelling, "Trump is not my president!" This is the most entertaining election I have ever witnessed. "face value" uhh , demographic breakdowns of who voted for two different candidates is not face value. you're still demonstrating a fundamental misunderstanding of polls. you cannot be harassed for partaking in a poll. there is no "coming out" for a poll when conducting research for election projections. sorry man, but I clicked both of those Youtube videos and one of them was from a prankster who does well known staged pranks. the other from something in the same vein. the Washington post piece if literally labeled "opinion" at the top and wasn't a front page news item, and the other is not an attack on anything really but Donald's policies and general stances about current policies. a week before the election hillary polled +1 in Michigan in 4 different polls. she lost in a tight in race in Michigan. there was no massive shift in voter activity. i really don't have an interest in continuing this until you get past the first part of being too "intimidated" to partake in a poll about who they are voting for. btw, as a general etiquette tip for having discussions: don't conclude your post with condescension in the style of a college freshman who just took his first philosophy course. especially when you're content with muddying the waters without saying anything substantial. Well, they don't have to worry about him being their president for long because he'll have them deported soon. I hope we get the illegals out sooner than later. They have no legal right to be in this country. End birthright citizenship, deport the illegals, build a wall and make mexico pay for it. Trump got less votes than McCain and won the election. That means you can look at the polls one of two ways; either the Democrats responded to polls more than they did the voting booth, or Republicans did the exact opposite. But even if the latter is true, how in the world are you going to say that they were scared of being polled but not of voting? That makes absolutely no sense. It's worth the five minutes. While I agree with what you are saying to an extent, you do understand the reasoning behind the electoral college is so that one region of the country doesn't have control over the rest, right? If we did things your way they might as well get rid of all 50 states and just have one big country with big cities and highly populated areas deciding what's what for everyone else. edit: to your point though, the way you say it I do understand and agree... it doesn't seem fair either, perhaps California should have more than 54 electoral votes? idk, just seems like that would rig it for democrats even MORE in future elections... which is why, like I said, we should all be giving Trump some credit, he did win fair and square, against all odds... even if it was against a criminal that had no business running. Media didn't tell us that, polls didn't tell us that, hell our neighbors, coworkers, teachers, friends, and family didn't tell us that. Trump was going to lose in a landslide... so that is why I think it's just best to move on and hope he does a good job!